Agapemone, also known as “The A,” was a religious cult established in 1846 in the village of Spaxton, Somerset (England). It was founded by the Rev. Henry Prince, who earlier had been ousted by the Bishop of Bath for his radical teachings. Prince went from saying that he was guided by the Holy Ghost, to declaring that he in fact himself was the Holy Spirit (one of the members of the Trinity). When Prince died, his successor – Rev John Hugh Smyth-Pigott – claimed to be the reincarnation of Jesus Christ. Aside from their heretical teachings, the cult founder and his successor were controversial for taking so-called “spiritual brides” from amongst their followers (“Agapemonites”). Theologically, Agapemone was a cult of Christianity. Sociologically the movement had cultic elements as well. Agapemone: [Gr.,=abode of love], English religious community of men and women, holding all goods in common. It was founded (c.1850) at the village of Spaxton, Somerset, by Henry James Prince (1811–99), Samuel Starky, and others. Prince and Starky were clergymen who had left (c.1843) the Church of England after Prince claimed that the Holy Ghost had taken up residence in his body. The Agapemonites proclaimed the imminent second coming of Jesus. Riotous conditions at the community caused scandal, and after Prince lost a lawsuit brought by two disenchanted followers in 1860, the community slipped from public notice. 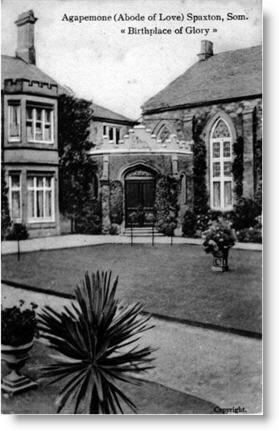 There was a period (c.1890) of renewed activity when J. H. Smyth-Pigott, who believed himself to be Jesus reincarnated, conducted meetings at an Agapemonite branch establishment in Clapton, London. He succeeded Prince as leader of the sect, which soon vanished. H. J. Prince, who had been a curate in the Church of England, and his rector, Samuel Starky, seceded to found the Church of the Agapemone. They announced at various times that they were the Holy Ghost, the Prophet Elijah, and the Two Witnesses of Revelation 11 (“These have power to shut heaven”), acquired a body of followers, and went in for varieties of scandalous wrongdoing until ( Marcion having been wrong) the law caught up with them. The thinly veiled claims of Father Divine to be God in our own time and country are too well known to need comment. When Kate Barlow was a little girl, she moved with her mother and her older sisters to a ramshackle English mansion. They were not alone on the once-grand estate, surrounded as they were by twenty eccentric, elderly women, one of whom was her grandmother . . . or was she? This remarkable memoir is the true story of life inside “The A,” the infamous Agapemone,* named for the Greek word meaning Abode of Love. It was a religious cult founded in mid-19th century England by a defrocked clergyman who claimed to be guided personally by the Holy Ghost. Agapemonites, many of whom were wealthy, unmarried women, lived together on the estate. They believed the Second Coming was imminent and that their founder would live forever. When Henry James Prince died unexpectedly, his successor declared himself the reincarnation of Jesus Christ, an announcement which caused rioting in the streets. The book reveals the author’s gradual awakening to the religious and sexual scandal that enveloped her family, as first the founder and then his heir — Kate’s grandfather — continued the practice of taking so-called “spiritual” brides. In fact, these relationships were physical as well as spiritual, and some produced illegitimate children, Kate’s mother being one of them. Life inside Agapemone was much like living inside a giant puzzle. It took years for Kate to assemble all of the pieces. When the final piece snapped into place, and she discovered the truth of her heritage, closure remained elusive. Today, she and her sisters are still connected to her grandfather’s cult as owners of the Arc of the Covenant, an exquisitely beautiful Victorian church built by the sect in north London. This first inside account of the infamous cult is also a story about family, and its lingering legacy on several generations, including Kate Barlow’s own mother. It is a gripping, sometimes humourous, deeply human tale.